1. Remove the driver's seat (see page 20-194). 2. Remove the power seat adjustment switch knobs (A) and the recline cover from the driver's seat. 3. 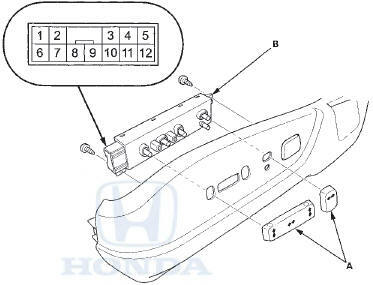 Remove the two screws and the power seat adjustment switch (B). 4. Disconnect the 12P connector from the power seat adjustment switch. 5. Reinstall the adjustment switch knobs to the switch. 6. Check for continuity between the terminals in each switch position according to the table. *:There is continuity without operating a switch. 7. If the continuity is not as specified, replace the switch.